Day 3 of mashed potato week, and I did the unthinkable. What makes everything better? That’s right! Bacon. Did the title of the post give it away? It’s okay, I wanted you to get it right anyway. 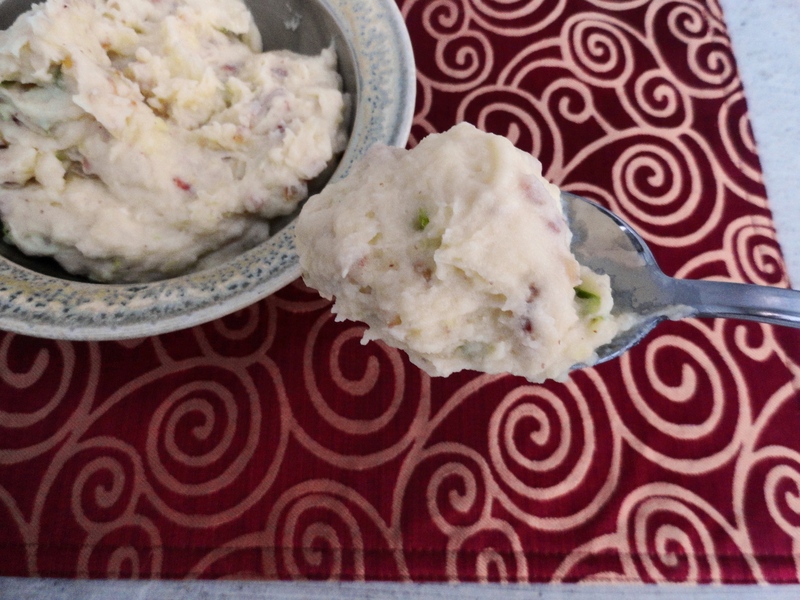 Of all the mashed potatoes I’m sharing this week, these are my second favorite. My favorite is tomorrow’s post, so come back to see what it is! I’ll admit, the mustard part sounded a little unusual, but it really just add a deep richness to the flavor, without actually tasting like mustard. The bacon really cuts through the acidity of the mustard and vinegar, balancing out the overall flavor. These would be a fantastic addition to any backyard barbeque, and a no-brainer side for anything smoked. 1. In a large saucepan, cover potatoes with water and bring to a boil. Add a generous amount of kosher salt and simmer over moderate heat until potatoes are fork tender, about 20 minutes. Drain potatoes. 2. In a large skillet, cook bacon over high heat until crisp, about 8 minutes. Transfer bacon to paper towel to drain. Pour off all but 2 tbsp of fat in the skillet. Return pan to heat and add onion. Cook over moderate heat until just starting to brown, 6-8 minutes. Add vinegar and mustard and cook, stirring continuously until most of the liquid has been absorbed, about 2 minutes. 3. In the same saucepan the potatoes cooked in, melt butter in milk over moderate heat. Remove from heat and press the potatoes through a ricer into the saucepan and mix well. Fold in the mayonnaise, bacon, onion mixture and parsley. Season with salt and pepper to taste. Think you don’t like Brussels sprouts? Think again. Ever wonder how Brussels sprouts get their name? I did. So I looked it up. And yes, it’s probably what you are thinking. The modern Brussels sprouts that we are familiar with today was first cultivated in large quantities in Belgium. Did I just blow your mind? No? Okay, well try these and I just might. Unfortunately, Brussels sprouts have an underserving reputation as “gross”. Many children and men (okay, probably some picky women too) avoid Brussels sprouts at all costs. Nate included. The problem stems from them not being prepared properly, and if something is gross the first time you try it, why would you try it again? Well, I’m telling you now, try them again. Use this recipe. I made these for our friends Thanksgiving and even Nate tried some, though he didn’t really say anything about them. But the fact that he ate more than one says enough. I did feel they were a little undercooked, but I think that’s much better than overcooked and soggy. Whether or not Nate eats these again, I’ll certainly be making them again. 1. Bring large pot of salted water to a boil. Add Brussels sprouts and cook until bright green, about 2 minutes. Drain well and pat dry. 2. In a large deep skillet, heat 2 tbsp olive oil until shimmering. 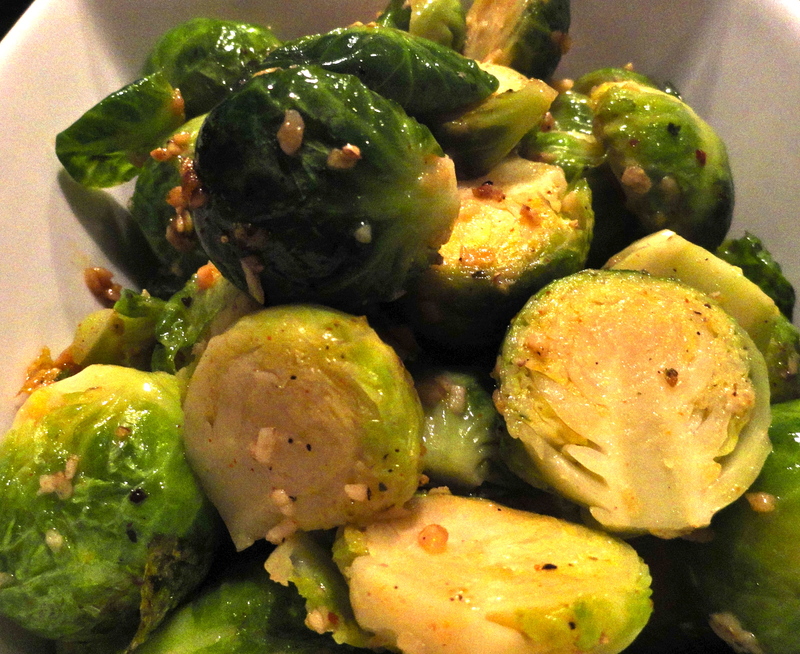 Add garlic and Brussels sprouts and cook over high heat, undisturbed, for 1 minute. Add crushed red pepper and salt and continue to cook over moderate heat until sprouts are browned and tender, about 3 minutes. Serve warm. Apparently I am really good at growing cucumbers. Clearly not much else as I have yet to get any ripe tomatoes out of my garden. I have plenty, but it’s September and they haven’t even started to turn red yet. Not one. 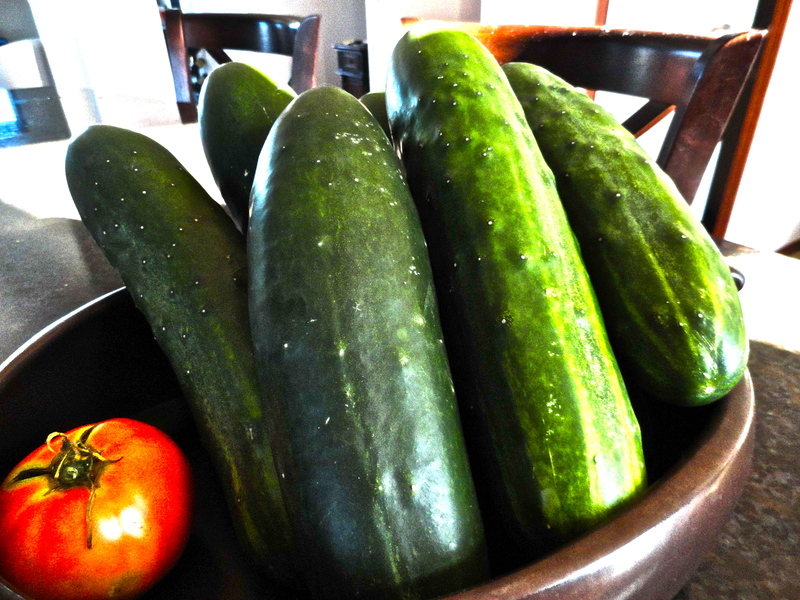 But, my cucumbers. Oh, my cucumbers! They are growing like nobody’s business, and I have had a ton this summer. So many that I actually had to make something from them instead of just slicing them up and eating them with some dip. With a little inspiration from a Chopped chef on Food Network, I made “quickles”, or quick pickles. I made a dressing of vinegars and a little oil, added some seasoning, and BOOM, quickle salad. We’ve had this in our fridge for probably the last month and continue to make and eat more as my garden keeps pumping out cucumbers. I need to come up with some other recipes to use my cucumbers, but for now, this will do just fine. It’s fun to change up the vinegars and seasonings. Fresh dill would be a great addition to this simple salad. 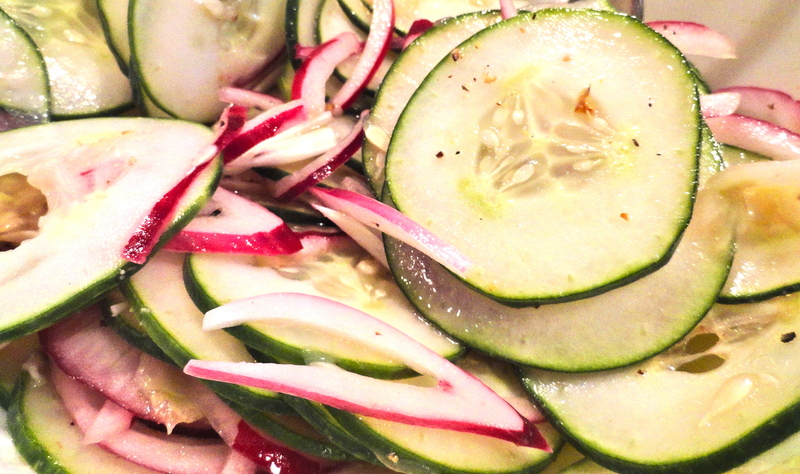 What’s your favorite cucumber recipe? 1. In a large bowl, combine cucumbers and onion. In another bowl, whisk together the vinegar and olive oil, adding in the seasoning to taste. Pour dressing over cucumbers. Refrigerate for at least one hour to let the cucumbers soak up some of the flavors. Keep in an airtight container in the refrigerator for up to a week. 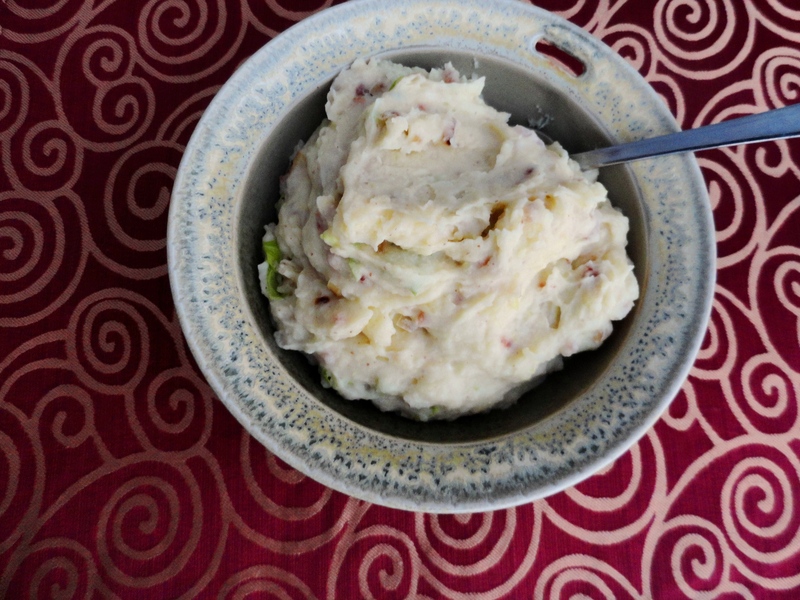 We don’t eat a lot of potatoes, so when we do, I want to make sure they are delicious! This recipe has been floating around WC ladies for a while, and I knew I wanted to try it as soon as I saw it. Salt and vinegar are one of those ultimate combinations (remember pesto and sun-dried tomatoes?). 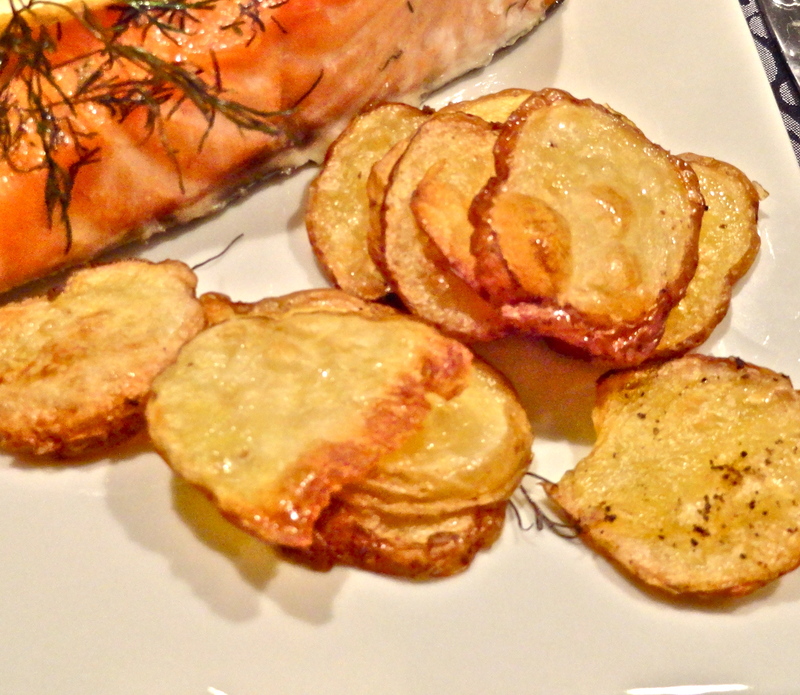 I though these would be perfect to pair with our lighter dinner of cedar-planked salmon with dill and lemon. 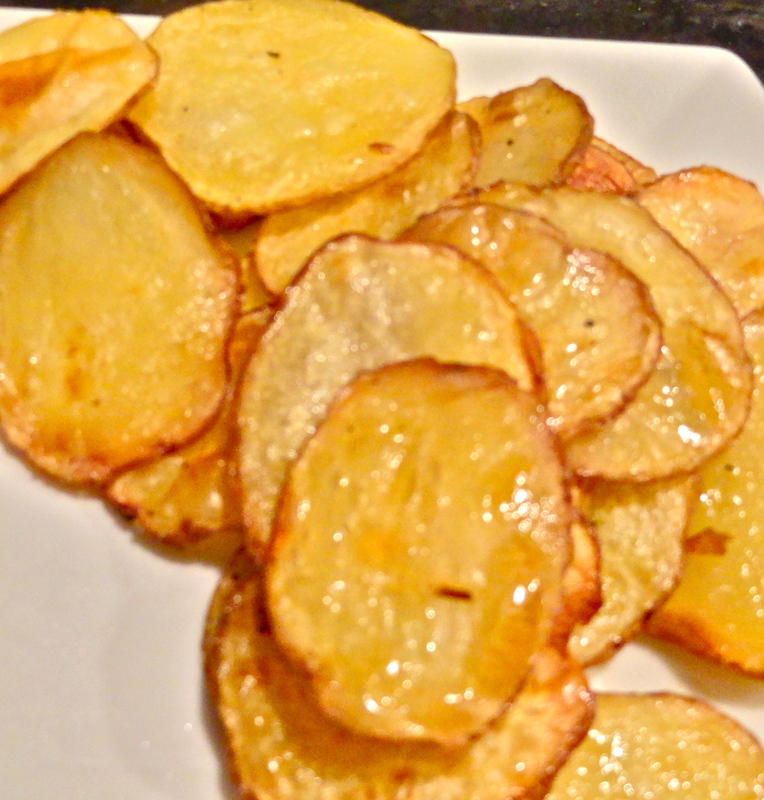 They really don’t look all the flavorful, but trust me, they are bursting with tangy vinegar! 1. Scrub potatoes and place in a large sauce pan. Cover with vinegar and bring to a boil. Once boiling, reduce heat and simmer for 8 minutes. Allow potatoes to cool in vinegar for 30 minutes. 2. Preheat broiler. Drain potatoes and pat dry. Place in a large mixing bowl and drizzle with olive oil. Add a generous amount of kosher salt, about 1 tbsp, and pepper to taste. Spread potatoes in single layer on foil lined baking sheet. You may have to work in batches. Place under broiler for 7-10 minutes, flip potatoes, then place under broiler again for another 7-10 minutes, or until crisped as desired. This is a good way to put a new spin on your zucchini (and maybe get those little ones to eat their veggies!). I really enjoy them, but Nate doesn’t care for them. Don’t let the name fool you; they aren’t super crispy, unless you wanted to bake the heck out of them and lose all zucchini flavor. Normally, I’d dip them in egg beaters before dredging in bread crumbs, but instead, you guessed it, I used plain non-fat Greek yogurt as that is what I have in the fridge. It actually gave them a little extra flavor and I thought they were delicious! 1. Preheat oven to 425 degrees. Line a baking pan with foil and spray lightly with olive oil. 2. In a small bowl, add zucchini chips and yogurt. Toss to lightly coat. 3. In a shallow dish, mix bread crumbs, thyme, salt and pepper. Dredge zucchini in bread crumbs, and place on baking sheet. Try to make one layer and not stack them on top of each other. 4. Bake for 5 minutes on each side or until breadcrumbs begin to brown. I’ve been wanting to make quinoa at home for quite some time, so I was happy to find this recipe to try. The jalapeno are an added bonus for me. I like the heat, so instead of steaming them, I kept them raw and added toward the end. 1. Heat 1 tsp of oil in a large saucepan over medium-high heat. Add the corn and cook until it begins to brown, about 5 minutes. Transfer to a bowl and set aside. 2. Add the remaining oil and onion to saucepan and cook on medium-low heat until onion is softened, about 8-10 minutes. Stir in the quinoa and increase the heat to medium and cook, stirring often, until the quinoa is lightly toasted and aromatic, about 5 minutes. Stir in broth (and jalapeno if you like less heat) and bring to simmer. 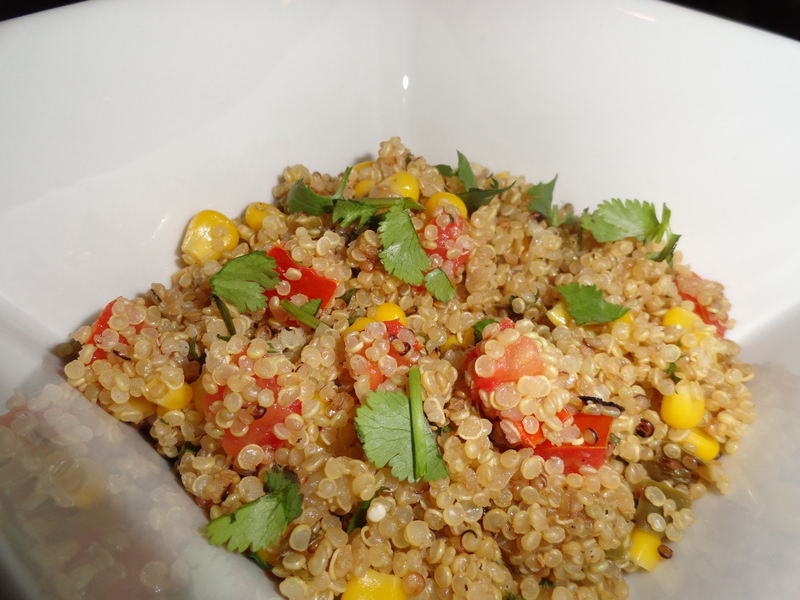 Reduce heat to low, cover and continue to simmer until quinoa is transparent and tender, about 16-18 minutes. 3. Remove from heat, stir in jalapeno (if you like more heat), and lay a clean kitchen town underneath the lid. Let sit for 10 minutes, then fluff the quinoa with a fork. Stir in the cooked corn, tomato, cilantro, and lime juice. Season with salt and pepper to taste.